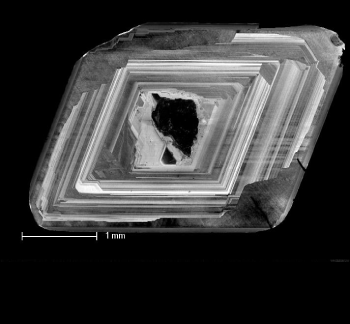 Cross section of the cathodoluminescence of a diamond. Surrounding the core the 'growth rings' are clearly visible. The rings are different in color due to the varying conditions in which the diamond is formed. Diamonds consist of highly compressed carbon atoms and develop deep underground at relatively high pressures and temperatures of over 1000 degrees Celsius. Earth scientists from VU University Amsterdam show that diamonds often have 'growth rings' similar to trees: due to changes in temperature and composition, the chemical composition in the growth zones changes, which leads to the development of 'rings' in the diamond. In addition, the scientists show that diamonds take millions of years to grow. Moreover, diamonds are often half as old as the Earth. Daphne Wiggers de Vries will defend her PhD thesis on this study on Thursday, September 19th. The investigated diamonds are from Yakutia in Russia and show that in this region they formed in two important periods in the past: 1 billion years ago and 2 billion years ago. Many individual diamonds record growth in both periods proving for the first time that diamonds take millions of years to form. In both periods, major changes took place in the Earth's crust: tectonic plates in the region pushed together causing fluids rich in carbon to move enabling the diamonds to grow. Because diamonds are so old and grow very slowly, they are perfect to learn more about the history of the Earth. Did diamonds begin on the ancient ocean floor? More information: Daphne Wiggers de Vries will defend her PhD thesis on Thursday, September 19 at 11:45 am (CET) at VU University Amsterdam.